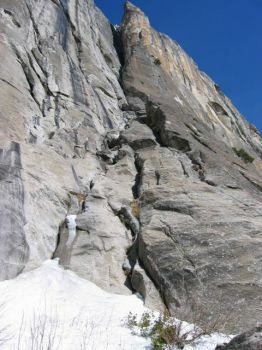 The is one of the all-time classic adventure routes in Yosemite. Expect lots of chimneys and off-widths, an incredible summit, and a museum-quality selection of old fixed pitons. The route has a fearsome reputation that is only partially deserved. You do need wide climbing skills but you don't have to be a wide climbing master or stick your neck out too far. Once you reach the notch, you can either climb to the rim or have someone drop fixed lines so that you can jumar out or do the more heroic tyrolean traverse.